Building things is truly an awesome pastime, hobby, and a means of making a living too. There are so many things that you can create on your own, for your own home, or for customers. Of course, you need to have the right set of tools in your arsenal. If you are a home handyman, a do-it-yourself kind of person, a carpenter, or anyone who likes to work with wood, metal, and anything else that needs to be drilled, sanded, or ground, the Dremel 220-01 Rotary Tool Work Station is quite the nifty tool to have. The Dremel 220-01 Rotary Tool Work Station is a multi-purpose work station for any carpenter, metal worker, artist, or handyman. It’s a convenient little work station that easily clamps down to most work spaces. It can hold drill bits, grinders, and sanding heads for various purposes. Its main function is to drill holes, as drill presses do, but it can also be used for other purposes, plus it can work vertically and horizontally too. What is surprising is that the Dremel 220-01 Rotary Tool Work Station is not even all that expensive for such a high-quality item with so many different functions. The Dremel 220-01 Rotary Tool Work Station is great for many different people. As long as you need to drill holes, sand things down, or grind items to size, this is a tool that can come in very handy. It’s not all that large, so it might not be best for very large projects, but other than that, it’s a great tool indeed. If you are an artist, handyman, carpenter, metal worker, a do it yourself person, or anything in between, you can probably find a use for the Dremel 220-01 Rotary Tool Work Station. When you buy the Dremel 220-01 Rotary Tool Work Station, you get the work station itself; there is not much else included. It’s a rotary drill press with a head that can accommodate sanders, drill bits, and other such tools. It can swivel, articulate, and turn on its side, plus it features a convenient plunge handle too. The included measurement system, crow’s nest bit holder, and the cord management system which are included all have good uses too. 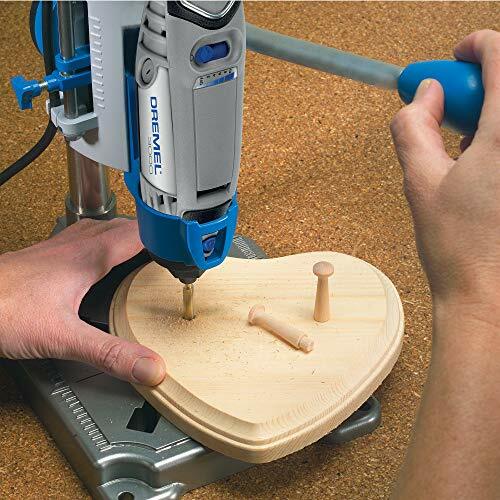 The Dremel 220-01 Rotary Tool Work Station is a very convenient and multi-faceted tool. It features a wide and steady base for balance, plus it comes with 4 clamping points so you can secure it to your worktable so it doesn’t shift or fall. Next, one of the best features is that the Dremel 220-01 Rotary Tool Work Station comes with a Flex Shaft Tool Stand. This is a fancy way of saying that it features a telescopic neck which can hold tools at heights between 16 and 29 inches for convenience. 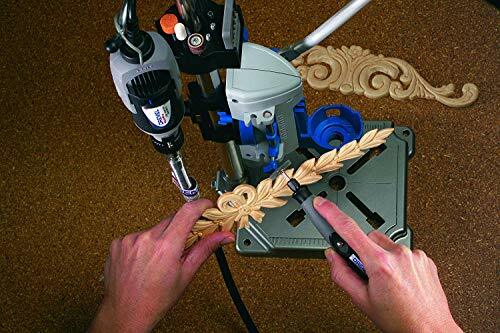 ​What is also convenient about the Dremel 220-01 Rotary Tool Work Station is that it comes with a crow’s nest bit holder; it can hold a variety of drill and sanding bits so you have them on hand whenever you need them. It also features a cord management system so cords from power tools never get in your way. On a side note, the base and shaft is made with really durable metal that’s not going to bend, crack, or break any time soon. 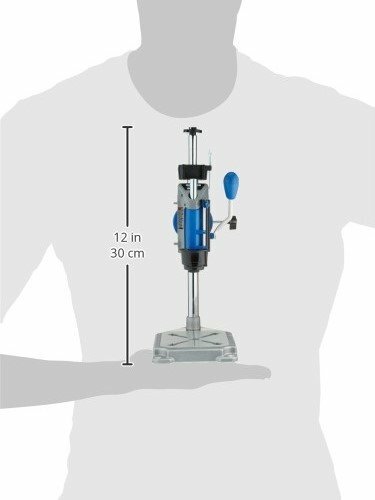 The Dremel 220-01 Rotary Tool Work Station is primarily an articulating drill press, or in other words, its main function is to drill holes in wood and other such materials. It can accommodate many different drill bits for various hole sizes. Also, it comes with metric and imperial measurement markings on the base for accurate drilling. ​This work station will allow you to drill angled holes at 15 degree increments up to 90 degrees, a convenient feature. 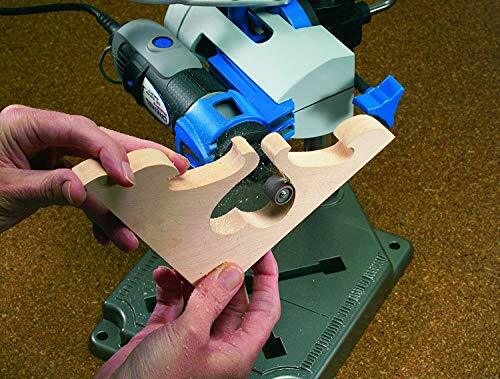 Moreover, it can also hold various tools sideways, or at a 90 degree angle, which helps if you are sanding or polishing things, or for grinding down metal. It’s a good option because it is compatible with Dremel Rotary Tool models 100, 200, 275, 285, 300, 395, 398, 400, 800, 3000, 4000, 4200, 8100, 8200, 8220. Even though tools can be quite complicated, this item is quite easy to use. Just clamp it into place wherever possible and you are more or less good to go. Simply attach the sanding, grinding, or drilling bit which you need, turn the item on, and get to work. If you are drilling, you can use the plunge handle for quick holes. If you need to grind or sand things, turn the Dremel 220-01 Rotary Tool Work Station on its side for easy access to the head. If you would like to watch a little how to video in regards to this tool, click on the link below. If you don’t like the item we have reviewed here, you can always take a look at the Dremel 4300-9/64 High Performance Rotary Tool Kit. The main difference is that the work station comes with a stand, so you don’t have to hold the tool, whereas it is purely a multi-function rotary too. In essence, they both perform the same tasks, but the work station holds the tool in place, whereas here you have to hold the tool. On the other hand, the work station does not come with any bits or heads, whereas the kit comes with a multitude of attachments and bits for various purposes. As you can see, the Dremel 220-01 Rotary Tool Work Station is quite the nice tool to go with. It features a sturdy, durable, and high-quality build. It has many different features and functions, making it an effective multi-purpose drill press, sanding tool, and grinder. It does not cost all that much and it can get many jobs done with ease.